I wasn’t ready to take down the Christmas decorating when I did. The house was decked out so full and pretty, with the Christmas ladder tree, and Christmas tree forest in a crate, and nothing was really in the way. However once I started cleaning up, it felt strange to have only parts disappear. And then it hit. I needed it ALL gone so I could play around with some fresh, new ideas. Rolling up my sleeves, I bit the bullet and started making piles. And piles and piles and piles. I’m kind of glad I had the clean up task. Although I kind of dreaded it, it kept me busy. I was feeing that low after a very high high if you know what I mean. It felt so quiet. A little too quiet. And tasks indeed fill in the blanks. So… my thoughts pondered. Go full out winter decorating perhaps? I tried. I put all this snow stuff out and white this and that, stood back, but it felt like Christmas all over again. Nope. I was ready for a fresh, clean start. So it all got tucked away. Except for a few choice elements. 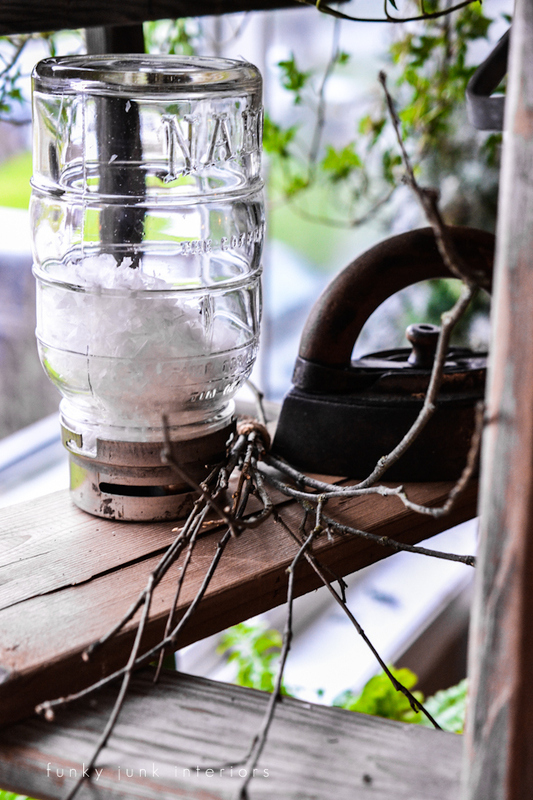 Two other signs of winter… the vintage Nabob coffee jar filled with faux snow and the twiggy rustic sticks. Would you believe this makes me smile? Winter makes me think back to my childhood farm. With all it’s tall, unruly yet majestic trees poking high into the white winter sky. They reminded me of the intense ice storms we use to have, while we huddled around the kitchen table, a flickering candle illuminating our board game. Funny. I knew we were cold because we wore coats inside. But I don’t remember being cold. Just the sound of crashing ice from the tall tree branches breaking, and our laughter in the dark. Ice storms were the best! Ahh… a little piece of my grandmother’s home. This was her iron. I don’t remember her using it, but I do remember her wringer washing machine greeting you at the back porch door as you walked in. Grandma also had one of those clothespin hanger things that looked like a mini vintage apron. Funny how memories are all linked together, isn’t it? 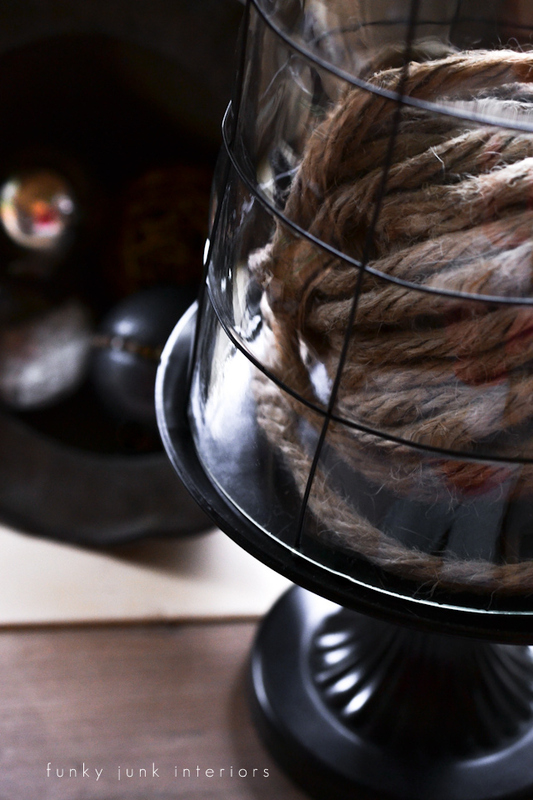 The cute cloche makes a return appearance, this time housing some heavy twine for a warm winter’s feel. Twine reminds me of binder twine from the bales I use to help haul. I always drove tractor, ‘hiring’ all my guy friends from school to come on over. The guys would do the throwing and stacking while I drove the fields. Most of the hay fields were further down the road, so we’d always do this stretch of drive with this hanging tower of crooked bales swaying high in the air, always wondering if we’d make it intact. Every now and then you’d get the ‘hollar’… when the bales came tumbling down. All part of the charm. 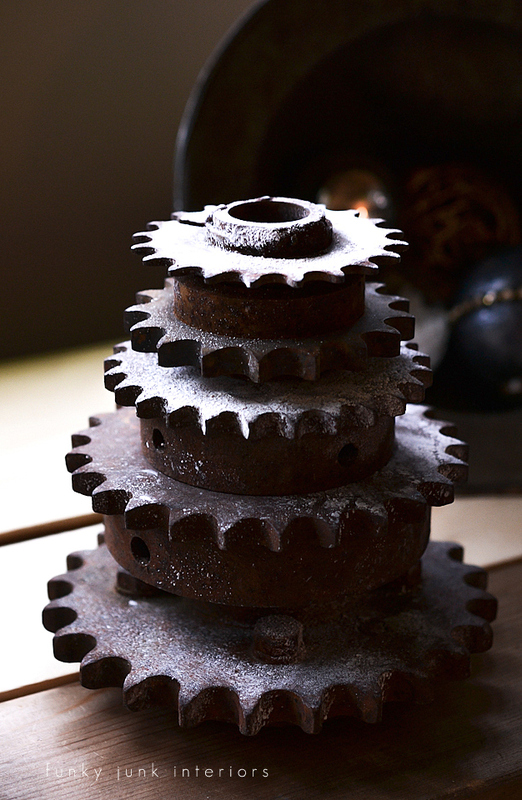 Pretty, rusty gears, how I love you so! They were still lightly misted with faux snow from the holidays, which provided the perfect winter highlight. Gears remind me of my dad’s sheds out back. They had shelves stacked with all things rust. 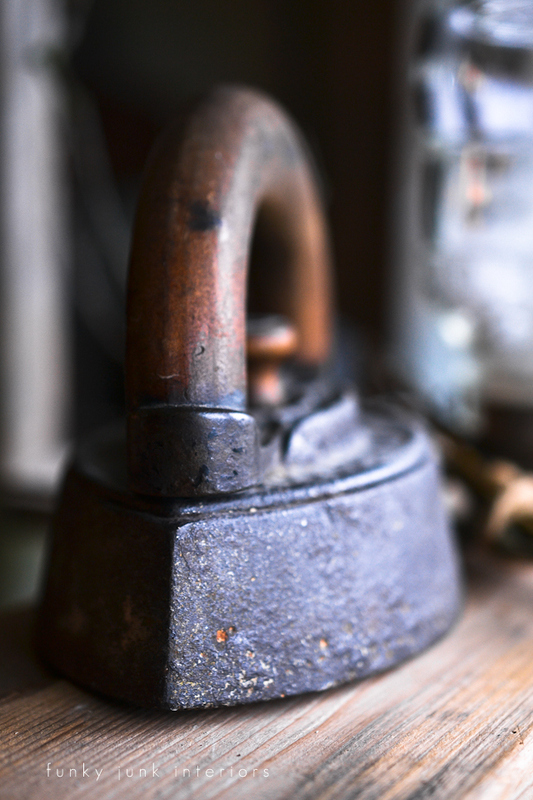 He stored nails and such in tins and they did their aging thing their own way. 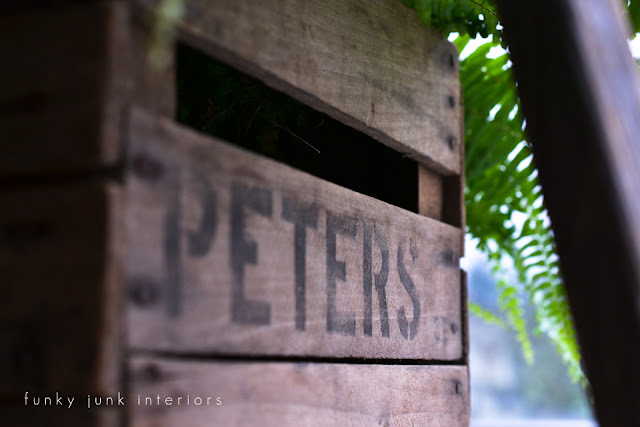 Ahh… and then there’s the Peters crate. This is a cute story. Friend Polly from Blackberry House was helping empty her parent’s barn many moons ago, when she discovered a crate with my Dad’s name on it. (Peter) She rescued it, then tucked it away, hoping to get it to me somehow, someway one day. When I dashed off to Bella Rustica in September, it was such a blessing that we finally had a chance to meet! And Polly promptly remembered and brought the crate! You bet I booked it in as a separate piece of luggage in order to get it home in one piece. A very special piece from a very special friend. 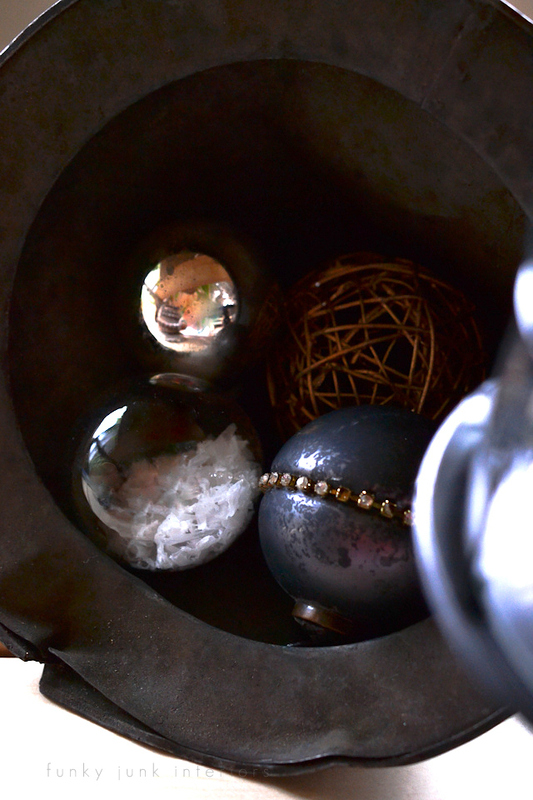 A rusty oil funnel is holding a few ornaments, with some remnants of winter and the festive season. I flat out wasn’t ready to hide all the Christmas decorating quite yet after all. Christmas reminds me of growing up in the old farmhouse. The kids would sneak downstairs, turn the corner into the living room, and see the massive tree all aglow with it’s heavy sparkling tinsel and vintage lights with the scalloped metal reflectors. There would always be one present unwrapped. And it was ‘the’ gift. The one we were dying to have at all costs! I still remember dashing to the tree and hugging our dream gift, while madly unwrapping the other ones. How could you not feel the love from your parents, offering you the desires of your heart? Well, it’s now time to move beyond the light and the tinsel and go strike out some new memory making material. And I do believe my plants fully approve! May the cool winter sunshine stream right through your own windows, warming up your special spaces and your heart. I enjoy reading your sentiments for things from your youth. One can only hold sweet memories if the experience was good, and you are blessed with that. So beautiful, you just have a knack for making it all look stunning! wow…is it me or are your photos getting even better than ever? They are fabulous! Can’t wait for my birthday camera!!! t wait to see what else you do! It all looks great. I love keeping a bit of winter around after Christmas. After all, winter has really just started, so why not celebrate it? 🙂 I completely get why the little bit of faux snow and sticks make you smile. It is definitely the simple things. How do you make this all look so easy and that darn cute! You have a gift! I would love it if you just loved down the road and we could yardsale together…lol. I do the programs at our library and am starting a group called the “Pike County Pickers”… you would fit right in. 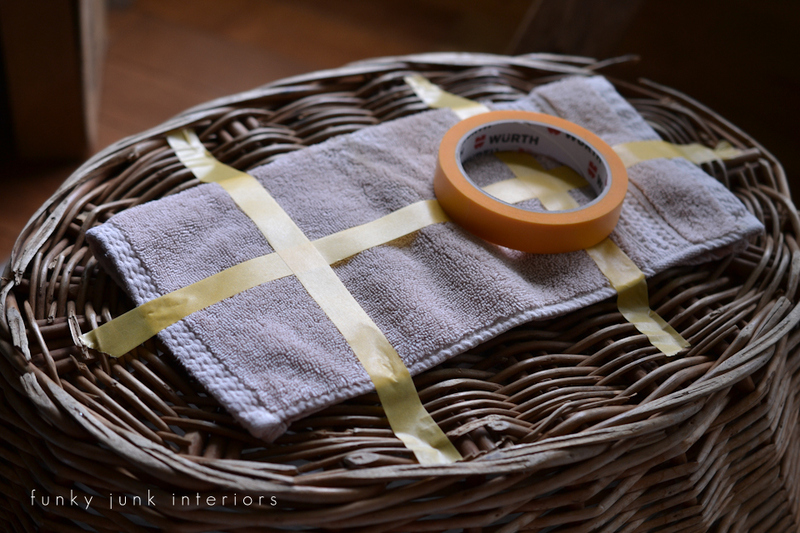 Every month a new trash to treasure idea. Our first month is “Making Rust.” I will try to do a post on it too. Okay, one of my New Years resolutions is taking the time to leave more notes for my blogging friends! I always read posts in a reader and it makes it hard to leave a comment or two. But I do not miss a post! Love seeing the things you share and your lovely home. I wish I had more time to blog, but I work part time at our local library. I wanted to share with you my new blog, just opened this week…. 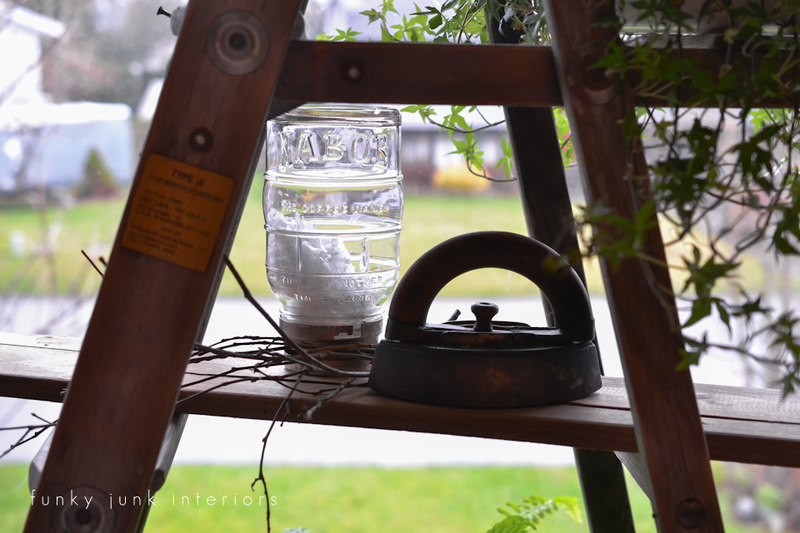 http://www.brookekroeger.blogspot.com…. it will be for my vingage and digital work… including printables you might enjoy. 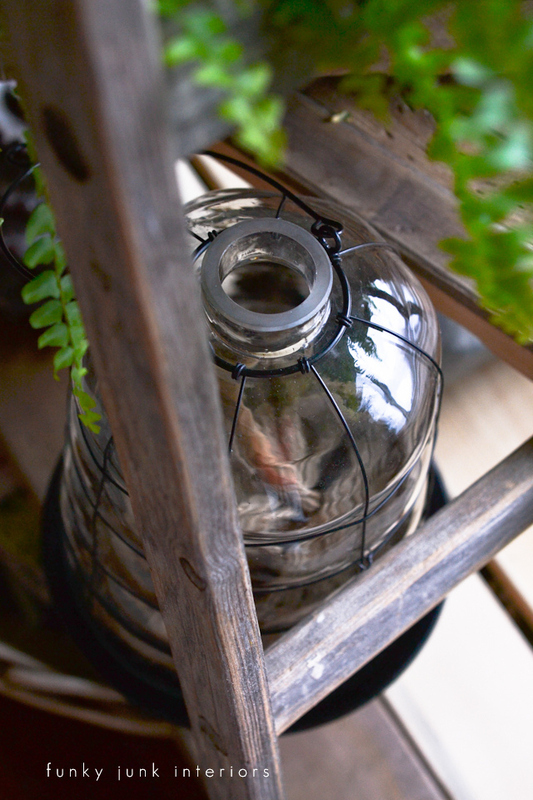 I also have my home and garden site, http://www.creativecountrymom.blogspot.com. This week I am doing a look back to my spring garden. What precious memories Donna and beautiful pictures to go along with every story. Thanks for sharing:-) Happy 2013 to you. Your post brought memories….Mom had a wringer washing machine and my job was to put the clothes through the wringer and then carry them out to hang on the line. I also remember the tinsel and metal reflectors on our tree. I do miss the tinsel. It made the Christmas trees look so pretty, but so much work to put on the tree. I thoroughly enjoy having my coffee with you and your creativity! And is that MMS’s book I see displayed on your ladder…? 🙂 Glo. Some how brought tears to my eyes. Didn’t want to give up this Christmas either. Beautiful dilay! 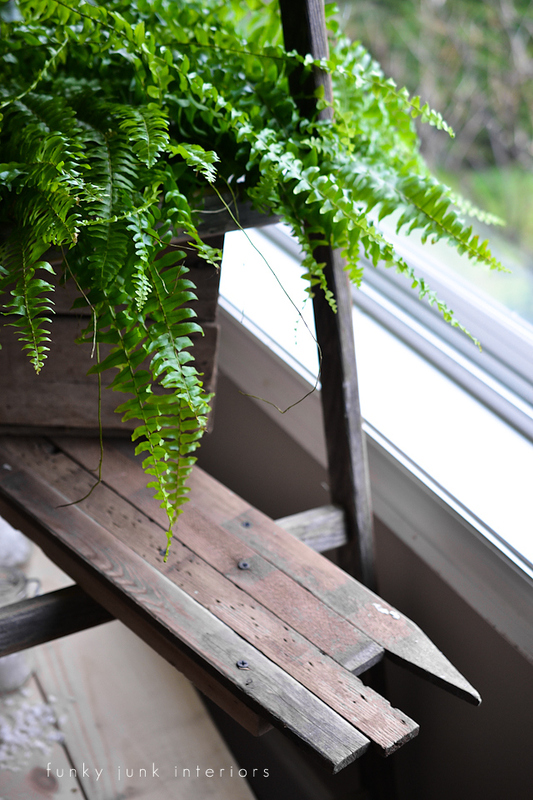 Time for me to invite house plants back to our house. What a truly lovely post. Thanks for inviting us down your memory lane. Those are some very sweet childhood memories you have. I have fond memories of growing up, but here in Northern California, it mostly just melds into the cold part of the year and the hot part of the year and that is how my memories are stored up too. That crate is really so sweet. What a treasure. 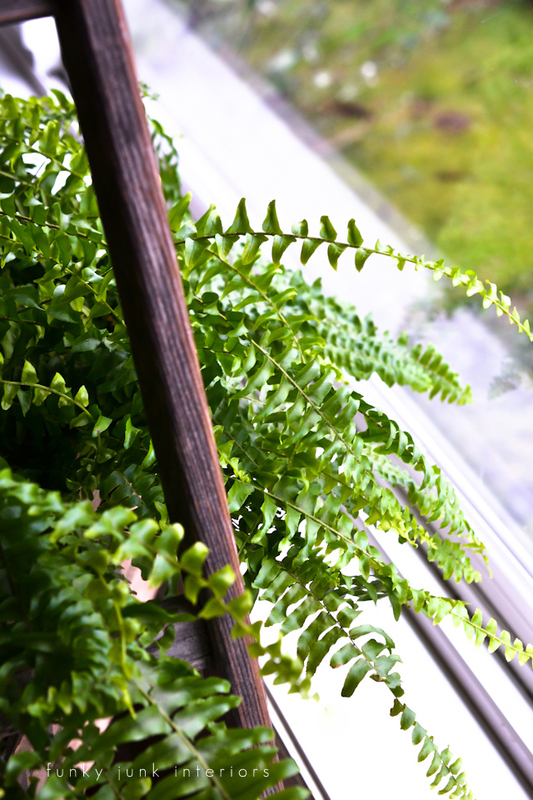 PS My mother had ferns and she treated them like her 5th and 6th kids. They were magnificent. 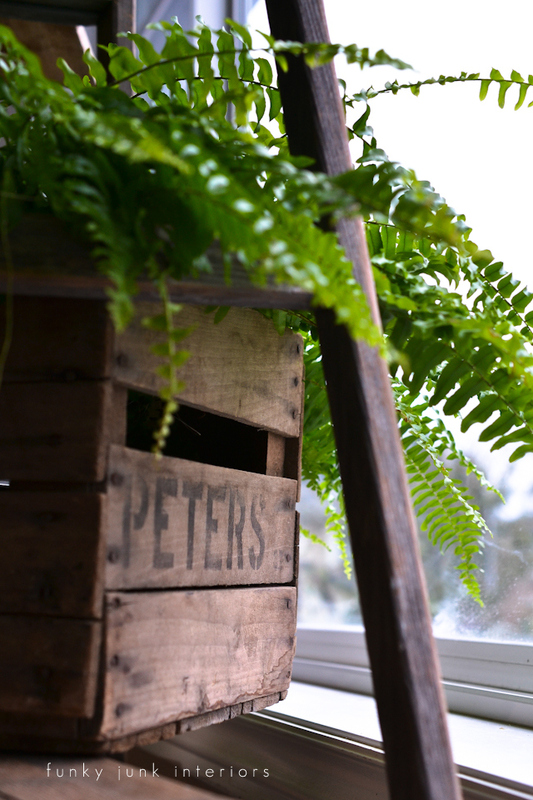 I love Ferns. Yours look gorgeous. 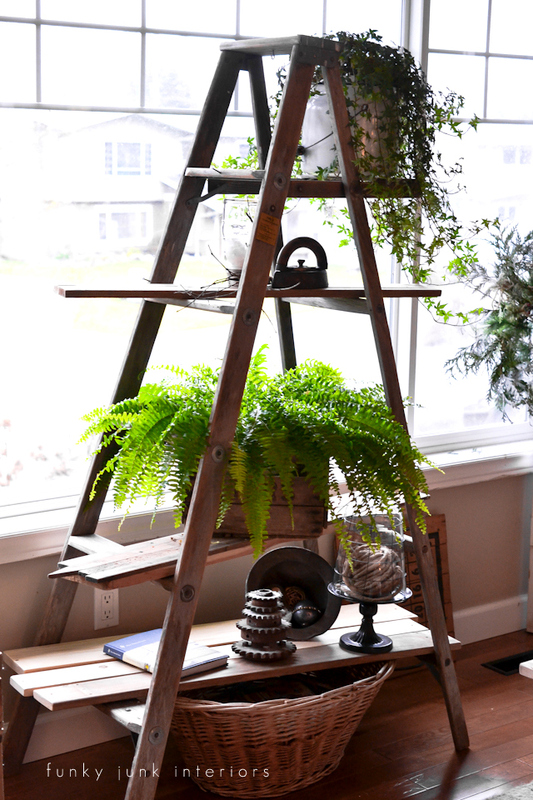 LOVE your ladder plant stand and your attached memories. The big window is a plus too. Outstanding photos. Thanks Donna for sharing your God given talent and memories. Love your site – same as my childhood memories. 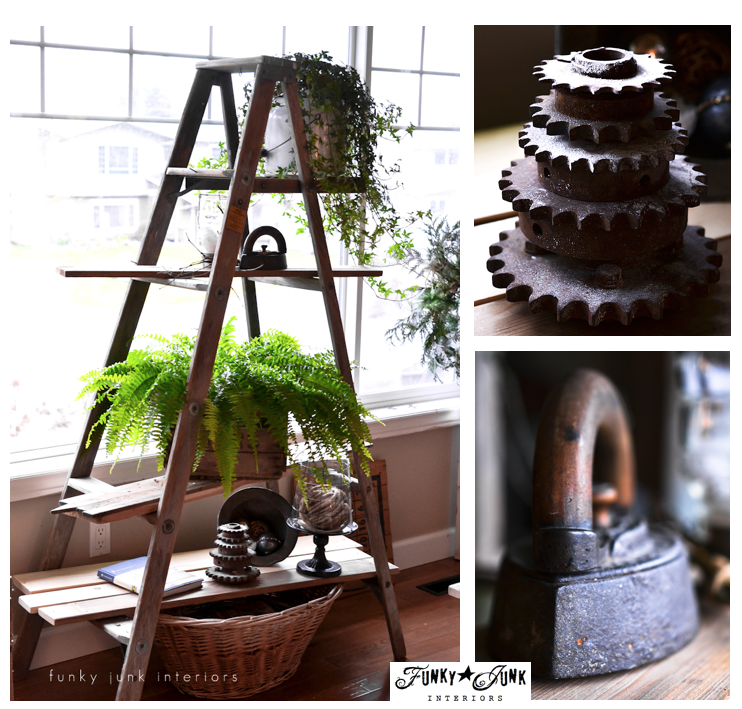 I have an antique ladder from my parents farm – beautiful display on yours!